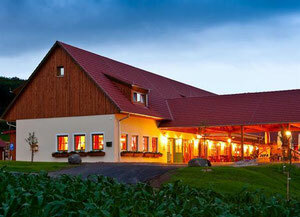 The youth hotel is very cosy and comfortably furnished in rural style. The 40 rooms are spread over several separate buildings. Our students live in spacious 5-bed rooms with bathroom and toilet. The house offers several lounge areas, table tennis and table football, a multi-fun court, a goat stable and a climbing area. It is locared on a hill and the view reaches far over the vineyards of the area. There is a supermarket in 10 minutes walking distance and the outdoor swimming pool with the big football field is not far away. Behind the house some beautiful hiking trails start. Especially praised is the rich breakfast buffet and also the lunch and evening buffet offers a delicious selection of regional and international dishes. 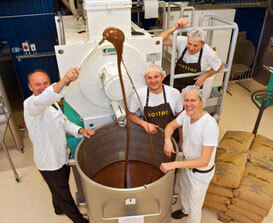 Tieschen is located in the southernmost part of Styria, a few km from the border town of Slovenia, Bad Radkersburg. 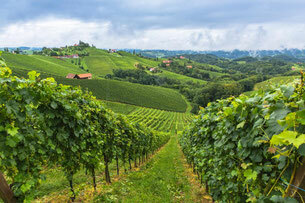 Due to its volcanic past, the country has many thermal healing springs and excellent soil for wine and fruit growing. The mountains over here are not high and the gorges not deep. It is a quiet area, not overcrowded by tourists, which invites to easy hiking and beautiful bicycle tours. 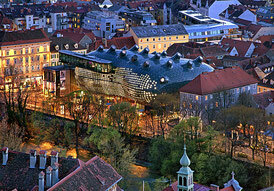 A city stroll can be undertaken in Bad Radkersburg and of course in the provincial capital Graz. 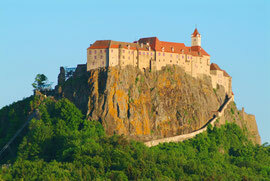 The Riegersburg fortress is one of the oldest well preserved castles of Austria. 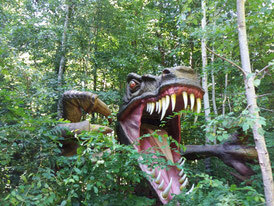 We go there by bus, up by elevator, have a tour through the castle, watch the falcons and bath in the near by lake. 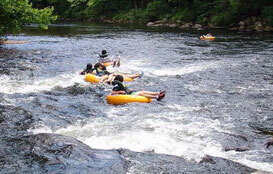 Tubing on the river Mur for about 1 hour adventure time with instruction, savety equipment and guide. Bus takes us back to starting point. 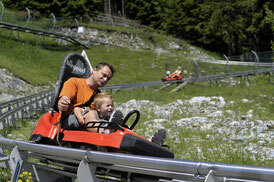 The Schöckl-mountain offers quite some attractions for young people. We go there by bus, up by cable car, having 2 rides on the tobaggon and hike down the hill. A very picturesque bike.tour (about 1 hour) to the old Mill-on-a-boat, the only one preserved in Europe. Guided walk through the 700 year Old-town with its hidden yards and catacombes. 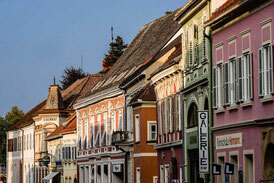 We take the bus to the capital of the province of Styria. There we tka a guided walk through the old town, and visit the most interesting sights in a walking distance.